How Did Into the Badlands Get To Be So Badass? Our Exclusive Interview! 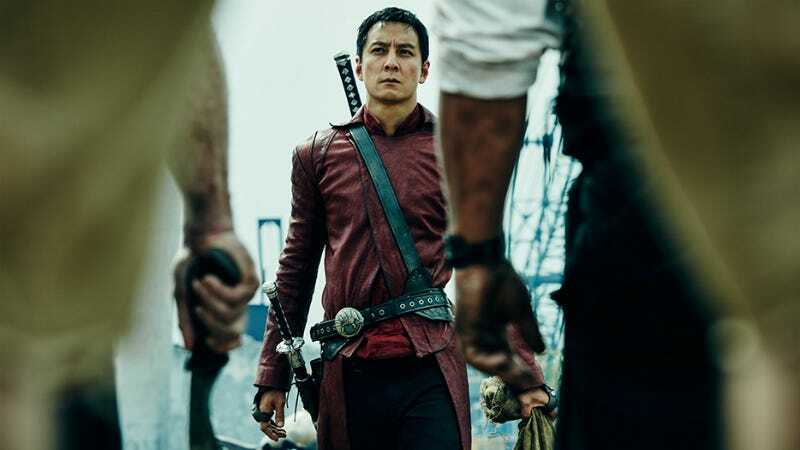 The first season of AMC’s Into the Badlands is already almost over—the (hopefully very bloody) season finale is Sunday. We talked to star Daniel Wu and showrunners Al Gough and Miles Millar about what we can expect. Gough and Millar, a long collaborating team of writers and producers who worked on Lethal Weapon 4, Shanghai Noon and Shanghai Nights, dubbed Badlands their “passion project.” They wanted to bring martial arts back to American TV, and they wanted to create a unique world that’s an amalgam of their favorite things. Originally, Wu was just supposed to be an executive producer. When it came time to pick a lead, they were all like—Oh yeah! There’s a guy sitting in this room who’s a legit martial arts machine! And then Wu (who has starred in scores of action flicks in China and Hong Kong) was cast as unstoppable assassin Sunny. The casting of Wu also marks something that’s so needed, but still frustratingly rare, on American TV: an Asian lead. Back in the ‘70s on Kung Fu—arguably the last show in the US to put martial arts at the forefront—the 100% white David Carradine was cast to play the half-white, half-Chinese Shaolin monk, Kwai Chang Caine. Badlands takes place post-apocalypse, though we’re still not exactly sure what happened. What we do know is that there was some cataclysm that really happened in the real world—the real world as we know it—as evidenced by relics and references: Tilda finds a snowglobe from Hawaii in a box full of artifacts, there are mentions of the Bible and The Cat in the Hat, and a plastic toy soldier grants Sunny an audience with the River King, like it’s treated as an icon. Beyond that, we don’t get any more background. Not even the characters seem to know what the hell happened. That’s intentional. Gough and Millar say that it might not have even been one thing, but an apocalyptic cocktail of threats like climate change, terrorism, and other modern-day death knells: “If they all ever coalesced, it’d lead to this mass extinction event,” Gough says. And now we have the Badlands. The team also didn’t want to portray this post-doomsday Earth as a dusty, dingy wasteland, but not as Blade Runner cyber nightmare, either. Instead, we have this lush, Louisiana backdrop, peppered with residual Southern culture, like grand plantations, clashing with the bloody, blade-filled battles the show’s becoming known for. Also woven into the atmosphere is pre-Industrial Revolution technology and Asian-inspired villages full of craftspeople and travelers in streets that resemble old China or feudal Japan. The showrunners say that feudal Japan also influenced the social structure of the world, with Barons as shoguns, Clippers as samurai, and Nomads as ronin. Which is part of why the odd juxtaposition and mash-up of genres, cultures, settings and time periods make for such an interesting show. Wu agreed that the “weird fantasy world”—one that blended a traditional martial arts drama, a dystopian future, and an American setting—is part of what makes Badlands so special. Email the author at bryan@gizmodo.com, or follow him on Twitter.